You can use the keyboard to set focus on specific fields and perform functions. Enable keyboard hotkeys in the Hotkeys tab on the Properties menu. 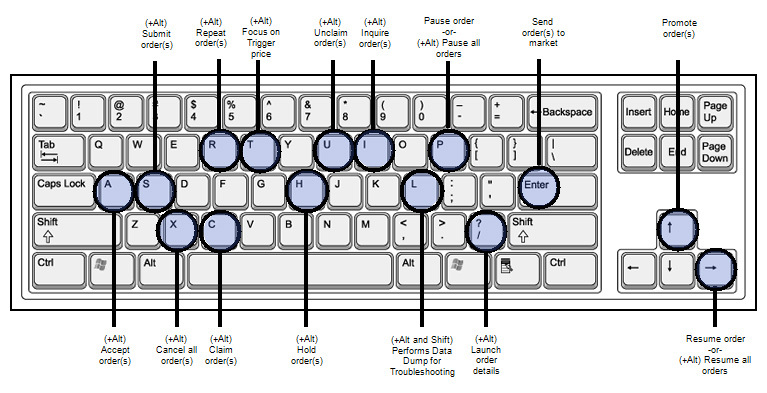 The function hotkeys consist of the Esc and F keys at the top of your keyboard. Cancels and replaces your existing order and moves it one tick up in the market. This is a cancel/replace order without further confirmation. Cancels and replaces your existing order and moves it one tick down in the market. This is a cancel/replace order without further confirmation. Opens the Floating Order Entry pane with a replica of the selected order. Executes a decrease in order quantity as a change order, keeping your position in queue. Deletes existing order and sends a new order to market. Sets your focus on the customer field. Sets your focus on the quantity field. Sets your focus on the price field. The main hotkeys are in the body of your keyboard. Accepts OTC orders sent from a third party. Submits held orders to the exchange. Cancels all working orders in the Orders and Fills Window. Lets you claim an unclaimed staged order and work it as your own. Lets you repeat the selected order. Sets your focus on the trigger price field. Removes an order from the market but stores it on the TT Gateway for later execution. Lets you release a staged order you claimed for someone else to work. Sends an inquiry to the exchange for the status of an order. Alt+Shift+L Performs data dump Creates a file containing all data from the Orders Pane and Fills Pane for troubleshooting. The file is placed in the <root drive>:ttlogfiles folder. Stops any further parent actions and leaves child orders in the market. Shows the order details in a ticket format. Sends selected orders to the market for an immediate fill. Promote selected order(s) Escalate staged order to external broker for further trade management and execution.